← WINE TASTING! 4 recommendations. We love big fat surprises. In this case, the surprise lies in the finish. This light- to medium-gold wine has a secret. First, when it’s cold, it doesn’t have much of a nose. The scents are subtle, with something salty at the top. But be aware: it’s like a very classy French whoopee-cushion—it gets you on the back end and you can’t help letting out a big grin. It starts off round, well-balanced, and refreshing in the mouth, then tart and snappy. Here’s the kicker: after swallowing, the finish gives way to an EXPANDING sensation in the mouth of spice, and an increase of intensity of taste and feeling on the outer edges of the tongue—an amazing effect. It doesn’t suffer much from warming up in the glass; it changes a little, exhibiting fruitier aromas and a more mellow spice finish. With the second glass, the spicy expansion was still there, but less so, and this fun package became silkier, like a Viognier. As it mellowed, we were impressed with its gentle, lemon-bar creaminess. Native to Southern France, Picpoul (or Piquepoule) is a bit of a contradiction, yet indeed lives up to its French compound-word name: “pique” (sharp and lively) and “poule” (soft and maternal). Sometimes used in blends, it is one of the 13 varietals permitted in the Chateauneuf-du-Pape and Cotes-du-Rhone wines. As a varietal, it is a favorite in the Coteaux du Languedoc area, with its sandy coastal vineyards around Sète, the Mediterranean seaport town. High in acidity and citrus flavors, and great with seafood, some call Picpoul “the Muscadet of Southern France.” It is reportedly the wine of choice for locals when enjoying oysters on the half-shell. Besides being a varietal, Picpoul de Pinet is an appellation (a recognized wine-growing area). West of the Mediterranean’s Golfe de Lyon, it is the largest white-wine producing area in the Languedoc, consisting of a triangle bounded by Agde, Pézenas and Sète, with Montpelier more or less in its center. 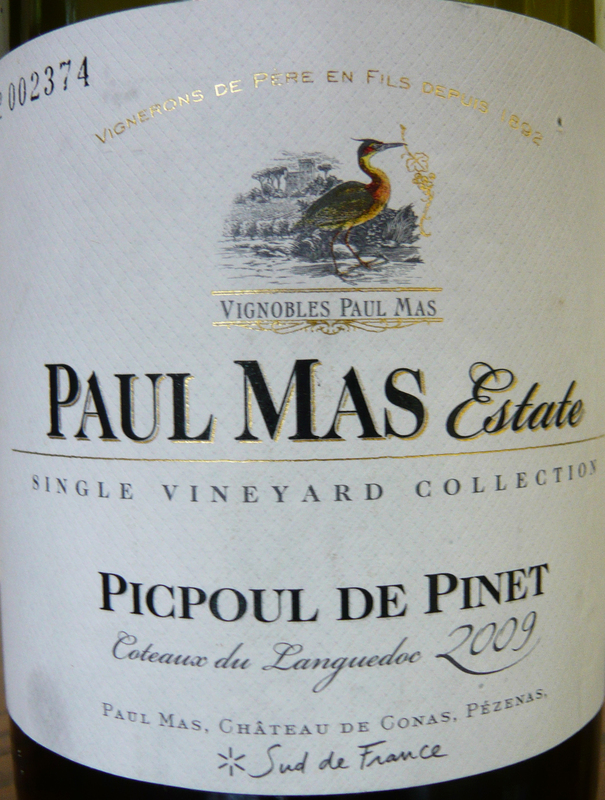 LABEL NOTES: Paul Mas Estate Single Vineyard Collection wines come from Jean-Claude Mas’ vineyards in the Languedoc Region in the South of France. Our Picpoul vineyard lies along the Etang de Thau, famous for oysters. This area nearby the village of Pinet is made of limestone soil and red soils in some parts; it has been privileged for growing white grapes since the Roman times, 2,000 years ago. Picpoul wine is part of the Mediterranean culture and an excellent companion to seafood and fish dishes, white meats, soft cheeses and fruit desserts. This entry was posted in France, Picpoul. Bookmark the permalink.